King Edward Private Residences: Baronial Elegance Nearly Sold Out! The King has spoken and the people have heard! The King Edward Private Residences [map] — regal condominium suites in the historic King Edward Hotel — is now 95% sold! Sales opened in June, and after only two weeks, units were nearly sold-out. The overwhelming response has enabled King Edward Realty to begin construction this fall, already making the project a grand success. The historical renovations are under the direction of ERA Architects, which will include the soon-to-be glorious Crystal Ballroom, with its two-storey high windows that overlook Toronto, left unused since the 1970s. 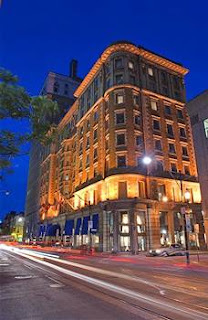 Residents will get royal access to all the amenities at Le Meridian King Edward Hotel and will live in “baronial elegance”–surely the only condominium in Toronto that could be described as baronial elegance! For those who still want to get in on the royal lifestyle, the remaining available suites are between 328 and 519 square feet and range in price from $329,900 to $564, 900. Visit the Presentation Centre at 37 King Street East before they’re gone! See our past posts on King Edward Private Residences here and here.